French legislators are visiting the parents of Gilad Shalit, who holds French citizenship and has been held hostage by Hamas nearly five years. Liberal French legislators are visiting the parents of kidnapped soldier Gilad Shalit, who holds French citizenship and who has been held hostage by Gaza-based Hamas terrorists for nearly five years. The visit, sponsored by the American Jewish Committee’s Project Interchange, is part of a continuing campaign by the Shalit family to press for their son, who was kidnapped in a Arab terrorist attack on an IDF checkpoint near Gaza. Two other soldiers were killed in the attack. Hamas has refused to release the soldier without Israel’s agreeing to free more than 1,000 terrorists who are in prison, including those who security advisors have warned will be a clear and present danger to Israelis if they are allowed to return to their homes. Last year, Prime Minister Binyamin Netanyahu told a rally for Shalit, “The State of Israel is willing to pay a heavy price for the release of Shalit, but it cannot say ‘at any price.’ Dangerous terrorists will not return to Judea and Samaria from where they will be able to continue harming Israeli citizens. “I am not prepared to repeat a policy that did not stand the test of time and led to the murder of dozens of Israelis.” Terrorists freed by Israel in the past several years have murdered approximately 150 Israelis after being freed from prison. 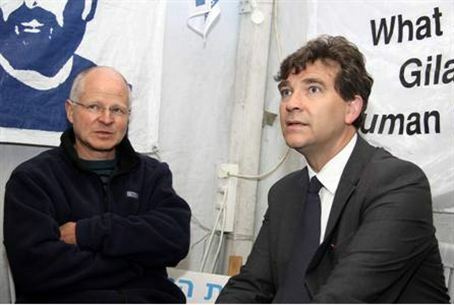 Shalit’s parents have pleaded for the release of their son regardless of the price. Hamas has continued to violate the Geneva Convention by refusing to allow family communication with their son and visits to the prisoner by representatives of the International Commitee of the Red Cross (ICRC). Last year, Ed Retting, Project Interchange’s acting director in Jerusalem, wrote that the public and government reaction to Shalit’s captivity represents a situation that is uniquely Israeli. “But Maimonides adds, ‘One may not redeem captives for more than their appropriate price, so that enemies will not pursue others to imprison them ….’ This warning has particular relevance today. As Hamas leaders openly call for further kidnappings, a sizable portion of the Israeli public opposes further concessions that will whet the Hamas appetite. Israeli soldiers who disappeared in action in northern Israel are Ron Arad (1986), Zachary Baumol, Zvi Feldman, Yehuda Katz (all 1982) Guy Hever (1997) and Majdi Halabi (2005).